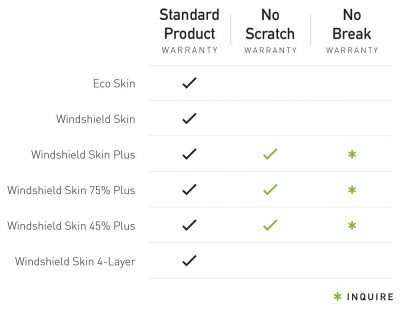 Bray Windshield Skin® was started to solve a simple problem – to eliminate windshield damage and the costs and inconveniences of replacement. From humble beginnings as an automotive tuner shop in the early 90’s, to present day leader in high-performance laminated manufacturing, the Bray brand has stayed endlessly committed to pushing the envelope of excellence and innovation in the automotive industry. 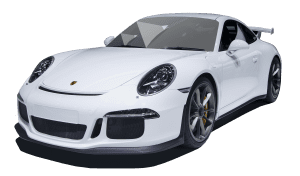 Today Bray is proud to be the world’s only windshield protection manufacturer with a total of 9 different products specifically developed for windshield protection. 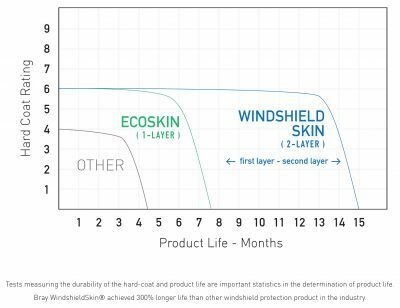 Advancing the traditional 1-layer windshield protection, the Bray Eco Skin® utilizes its hard coat technology to increase product life, while also providing a cost effective windshield protection system. Bray’s 1-layer system is a viable entry point into windshield protection. Windshield protection products are a disposable product and have a set life expectancy. Bray products come with the highest graded hard coat and give the longest life span per layer of material available. Bray offers many different types of material so make sure you pick the material that best fits your needs. The easiest method to extend your windshield protection layers’ life is to follow and maintain the correct cleaning process. The wrong cleaning process can cause hard coat lift, increase scratching, increase wear and tear and heighten the risk of visual impairment. Each layer of material lasts 5-12 months depending on maintenance and environmental conditions. 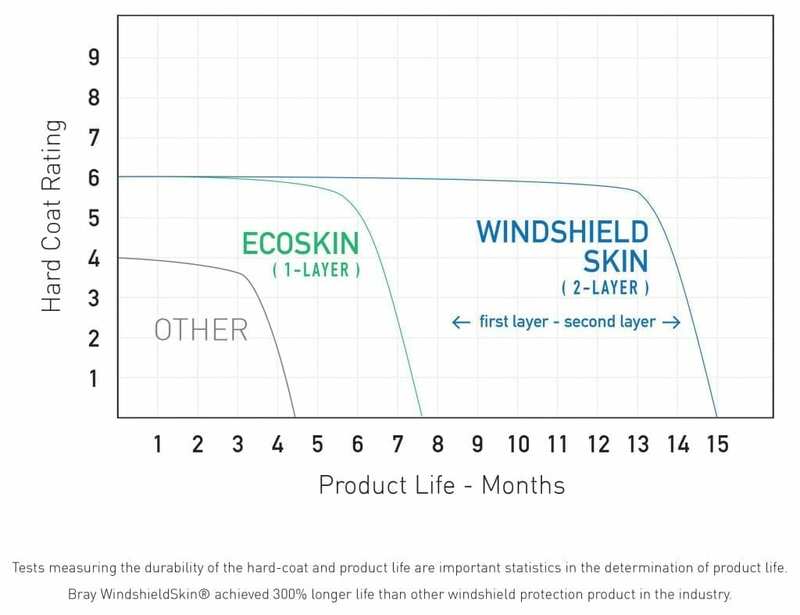 Windshield Skin®2-layer material will last twice as long and at a minimal additional cost. 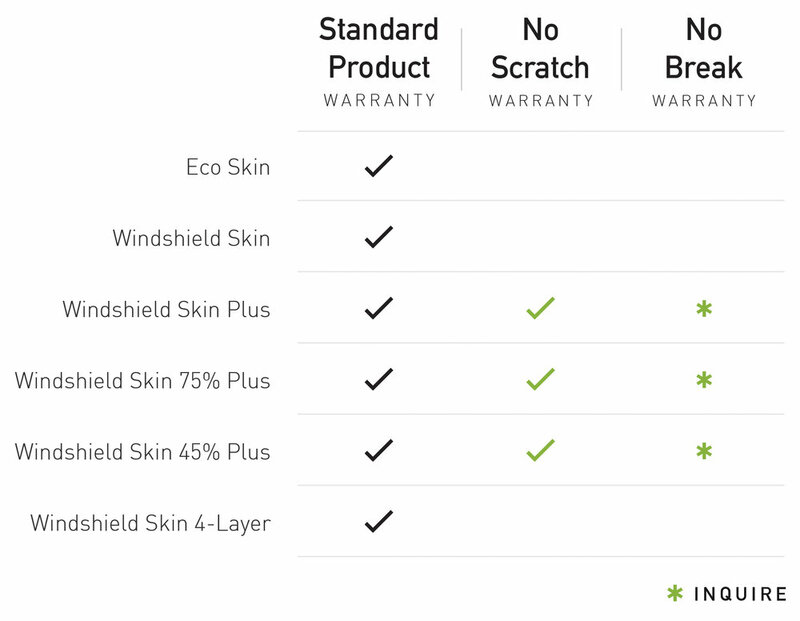 Our new Windshield Skin® System employs a 2-layer system that makes all windshields safer and more convenient to use. Because it sits right in front of you on your vehicle, Bray’s Windshield Skin® is made to the absolute highest quality and clarity. For example, the optical-grade, scratch resistant hard coat is an incredible crystal clear 6H+ hardness. Bray’s 2-layer system also lets you remove a worn, single layer within seconds – by simply grabbing the top layer and pulling across the windshield. Now the damaged layer is removed and a completely new layer is exposed and ready to protect your windshield out on the road. 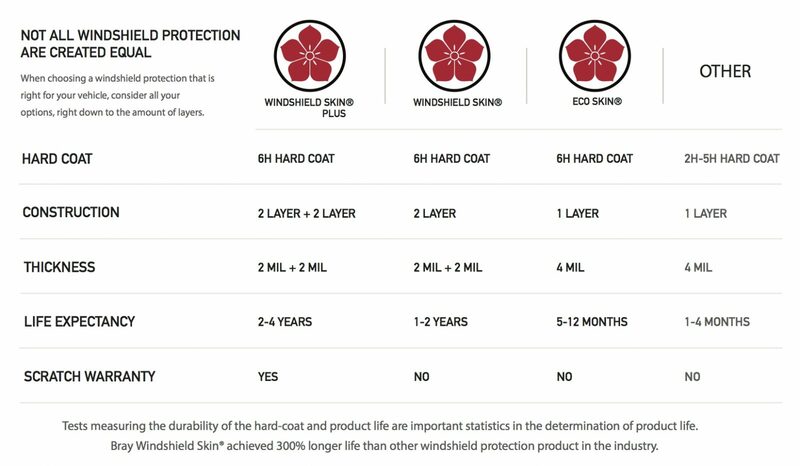 The pioneer of the windshield protection industry, Bray’s new 2 Layer Windshield Skin® PLUS System employs a 2-layer material along with a No-Scratch Warranty program, giving it a total of 4 layers of material at no additional cost. The optical-grade, scratch-resistant hard coat is an incredible crystal clear 6H+ hardness. Bray’s 2-layer system also lets you remove a worn, single layer at a time. Now the damaged layer is removed and a completely new layer is exposed and ready for the road.